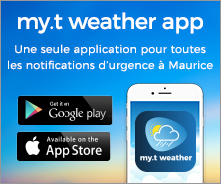 When a Tsunami Warning Bulletin is issued by the Mauritius Meteorological Services, announcements to evacuate will be made through TV & radio stations and Police hailers. The public is advised to follow the directives of the Police during evacuation. Those living or working in coastal areas should immediately move to higher grounds or evacuate vertically wherever tall strong building, made of concrete, is available. If you see an unexpected rise or fall in the sea, a tsunami may be approaching. You are strongly advice to move uphill. Prepare an emergency kit with basic necessities (water, food items, blankets, first aid supplies, medicines, radio torch) which is portable during evacuation.